Background: Mathematical modeling of biological systems is an attractive way for studying complex biological systems and their behaviors. Petri Nets, due to their ability to model systems with various levels of qualitative information, have been wildly used in modeling biological systems in which enough qualitative data may not be at disposal. These nets have been used to answer questions regarding the dynamics of different cell behaviors including the translation process. In one stage of the translation process, the RNA sequence may be degraded. In the process of degradation of RNA sequence, small-noncoding RNA molecules known as small interfering RNA (siRNA) match the target RNA sequence. As a result of this matching, the target RNA sequence is destroyed. Materials and Methods: In this context, the process of matching and destruction is modeled using Colored Petri Nets (CPNs). The model is constructed using CPNs which allow tokens to have a value or type on them. Thus, CPN is a suitable tool to model string structures in which each element of the string has a different type. Using CPNs, long RNA, and siRNA strings are modeled with a finite set of colors. The model is simulated via CPN Tools. Results: A CPN model of the matching between RNA and siRNA strings is constructed in CPN Tools environment. Conclusion: In previous studies, a network of stoichiometric equations was modeled. However, in this particular study, we modeled the mechanism behind the silencing process. Modeling this kind of mechanisms provides us with a tool to examine the effects of different factors such as mutation or drugs on the process. Small interfering RNAs (siRNA) are 20–25 nucleotide, double-stranded RNA molecules which have an important role in RNA interference pathway., siRNAs cause degradation of the target messenger RNA (mRNA) by complementary matching. They were first discovered as a part of posttranscriptional gene silencing mechanism in plants. It is reported that synthetic siRNAs are able to induce gene silencing in mammalian cells. The discovery caused an interest in designing siRNAs for biomedical research. An important step in understanding the mechanism by which siRNAs play their role in gene silencing is uncovering the rules behind complementary matching between siRNA and its target mRNA. Mathematical modeling paves the way for unfolding these relations and rules. Different mathematical methods have been proposed to model complex biological behaviors. Graphical methods have received much attention due to their ability to be comprehensible both for biologists and engineers. Petri Nets are a graphical and mathematical formalism for the modeling and analyzing of concurrent, asynchronous, and distributed systems. Modeling biological systems via Petri Nets was first proposed in. Many biological systems have been modeled using Petri Nets since., Also different analyzing approaches have been introduced using these nets. The translation process, due to its importance, has been a subject of study. In, the translation process has been modeled using Colored Petri Nets (CPNs) in gene expression level. The model was used to answer questions about transfer RNA binding sites. Authors in  have studied the effects of a mutation in translation process using CPN. A structure is proposed to identify the mutations which happened in the translation process. The present paper models the matching process in which a siRNA matches parts of RNA string to downregulate the gene expression. Because of the structural formation of some important biological molecules such as DNA, RNA, and proteins which have a string-like composition, Strings play an important role in computational biology concepts. Thus, modeling these structures may very well define a huge part of cell activities. Modeling is conducted through CPN Tools, software for modeling systems using CPNs. P ∩ T = Φ and P∩ T = Φ. In years, different versions of standard Petri Nets evolved. One of these extensions is CPN. Unlike standard Petri Nets, in CPNs, tokens accept data type and data manipulations. CPNs are a combination of Petri Nets and programming languages. Control structures, synchronization, communication, and resource sharing are described by Petri Nets, and data manipulations are described by functional programming languages., CPN Tools is software which supports CPN modeling and simulations. The model is represented by CPNs. Simulations were conducted through CPN Tools, an environment for modeling and analyzing systems based on CPNs. 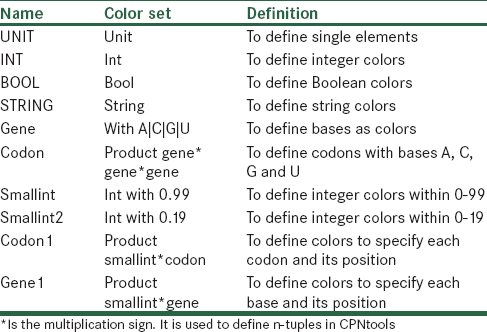 Color sets used in the model are presented in [Table 1]. The model was constructed with 18 places and 9 transitions. Important transitions and places along with their functions are illustrated in [Table 2]. The constructed model is illustrated in [Figure 1]. Although we appreciate the fact that mRNA sequences are commonly longer than 1 Kb, Modeling was conducted for strings of <100 units of bases length due to simplicity but it can easily be extended by using the current model as a hierarchical level in a more sophisticated model structure. In order to simulate the process, two stochastic strings with different lengths of 100 and 20 units of bases were produced to represent RNA and siRNA strings, respectively. The lengths were controlled by two counters specified by the corresponding places “count 1” and “co”. The goal is to determine if the shorter string (or actually its complement) is part of the constructed RNA string. If the matching happens, the corresponding gene is silenced. The first step in the modeling process is to construct RNA and siRNA strings. P1, P2 and P3 are the three places responsible for the production of RNA string. The color type associated with each of these places is “gene.” As introduced earlier, this type is made of four different bases: A, C, G, and U. By firing the transition “RNA sequence production,” three bases form a codon. The process continues as long as we have 33 codons (or a string of 99 bases). Similarly, place P4 and transition “siRNA production” produce a string of length 20 which represents siRNA. During the next level, each base in the RNA sequence along with its position is identified. For this purpose, place “test” is introduced which contains four bases: A, C, G, and U. The identifying mechanism is as follows. 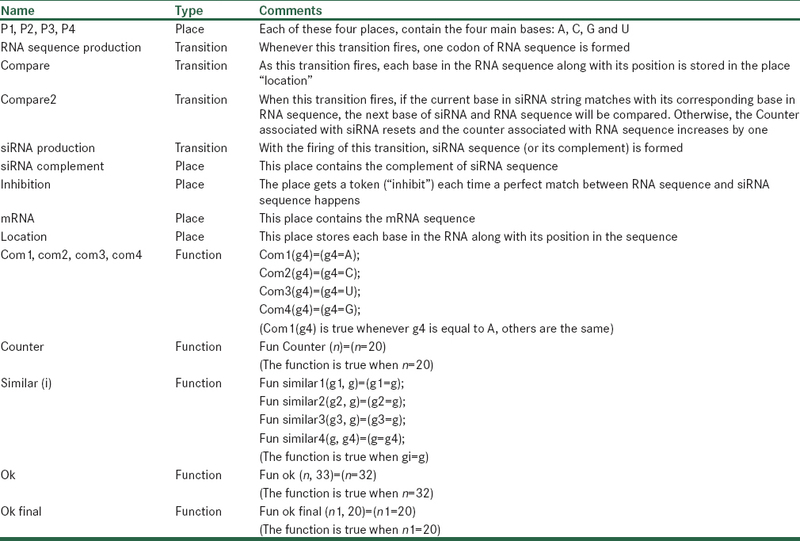 One by one, the four main bases are selected from the place “test.” Then they are compared with the whole RNA string. Whenever a base in the string is a match with the selected base from the place “test”, name and position of the base are transferred to the place “location.” At the end of this level, all elements of the RNA string are identified. At last, RNA and siRNA strings are compared with each other in the following way. One by one, each base in the siRNA string is chosen and compared with the RNA string. Whenever a match happens, the next base in the siRNA string is chosen and compared with the next base of RNA string. The perfect match and consequently the inhibition happen when the number of matches in a row is the same as the size of siRNA string. The place “inhibition” indicates a perfect match if it contains any tokens. Otherwise, if a chosen base of siRNA string does not match its corresponding base in the RNA string, siRNA goes to its first base, and RNA moves a base forward and the comparison starts all over again. In the present paper, the process during which siRNA matches with parts of mRNA string was modeled. 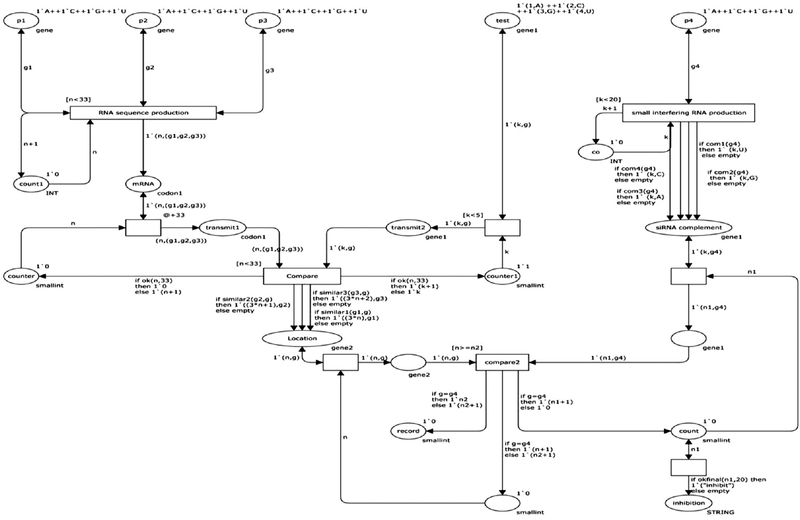 Modeling was conducted using CPNs in CPN Tools modeling environment. The model of the matching process is actually a string mining program with siRNA as the target. In previous studies,,, a network of stoichiometric equations was modeled. However, in this particular study, we modeled the mechanism behind the silencing process. Modeling this kind of mechanisms provides us with a tool to examine the effects of different factors such as mutation or drugs on the process. In others words, instead of modeling the components of the network, we modeled the logic behind the process. This model may serve as a basis for mutation recognition or in a more advanced application, and it may actually help to design appropriate drugs to halt gene expression in desired cases. Future models may include more sophisticated details of the process, especially in RNA structure and matching rules. Chiu YL, Rana TM. siRNA function in RNAi: A chemical modification analysis. RNA 2003;9:1034-48. Elbashir SM, Harborth J, Lendeckel W, Yalcin A, Weber K, Tuschl T. Duplexes of 21-nucleotide RNAs mediate RNA interference in cultured mammalian cells. Nature 2001;411:494-8. Hamilton AJ, Baulcombe DC. A species of small antisense RNA in posttranscriptional gene silencing in plants. Science 1999;286:950-2. Chaouiya C. Petri Net modelling of biological networks. Brief Bioinform 2007;8:210-9. Reddy VN, Mavrovouniotis ML, Liebman MN. Petri Net representations in metabolic pathways. Proc Int Conf Intell Syst Mol Biol 1993;1:328-36. Carvalho RV, Kleijn J, Meijer AH, Verbeek FJ. Modeling innate immune response to early Mycobacterium infection. Comput Math Methods Med 2012;2012:790482. Liu F, Blätke MA, Heiner M, Yang M. Modelling and simulating reaction-diffusion systems using coloured Petri Nets. Comput Biol Med 2014;53:297-308. Gilbert D, Heiner M, Liu F, Saunders N. Colouring space – A coloured framework for spatial modelling in systems biology. Appl Theory Petri Nets Concurr 2013;7927:230-49. Peleg M, Gabashvili IS, Altman RB. Qualitative knowledge models in functional genomics and proteomics. In: Akay M, editor. Genomics and Proteomics Engineering in Medicine and Biology. 1st ed. Canada: John Wiley and Sons; 2006. p. 1-21. Yang J, Gao R, Meng MQH, Tarn TJ. Colored Petri Nets to model gene mutation classification. Intelligent Control and Automation (WCICA); 2012. p. 5077-82. Christensen S, Mortensen KH. Teaching Coloured Petri Nets – A Gentle Introduction to Formal Methods in a Distributed Systems Course. Vol. 1248. Springer Berlin Heidelberg: Lecture Notes in Computer Science; 1997. p. 290-309. Jensen K. A brief introduction to coloured Petri Nets. Tools and algorithms for the construction and analysis of systems. Int J Softw Tools Technol Transfer 1997;8:203-8. Jensen K. An introduction to the practical use of coloured Petri Nets. Vol. 1492. Lectures on Petri Nets II: Applications; 1998. p. 237-92. Jensen K, Kristensen LM, Wells L. Coloured Petri Nets and CPN Tools for modelling and validation of concurrent systems. Int J Softw Tools Technol Transfer 2007;9:213-54.